Belgium, 2017-May-22 — /Travel PR News/ — Brussels Airport today (May 19, 2017) laid the symbolic first stone of two new fire stations on the airport tarmac, west and east of the airport terrain. The two new buildings will accommodate not only the fire service, but also the various associated rescue services, such as the medical service. They will also provide more space for new material, such as fire engines and robots, in which Brussels Airport has made considerable investment in recent years. 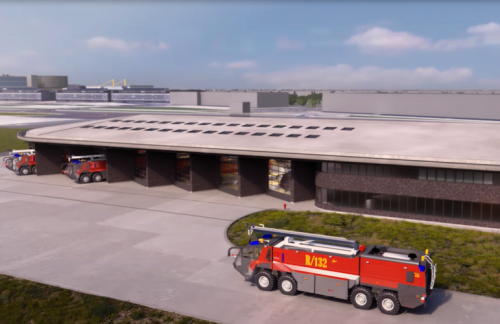 The airport operator, Brussels Airport Company, is building two new fire stations on the airport tarmac in the coming years. At the moment, the airport has three fire stations, one of which is located next to the terminal and the two others on the airport tarmac. Built in the 50s, the present infrastructure on the tarmac is reaching its capacity and age limits. Rather than extensive renovation of the existing infrastructure, Brussels Airport has decided to invest in the construction of two new fire stations on the tarmac. These are bigger than the present buildings, and will provide more space for the most modern engines which the Brussels Airport fire service has at its disposal, such as crash tenders and fire-fighting robots. The two new stations will be located to the west and east of the airport terrain, instead of to the north and south as they are currently situated. The presence of the new buildings will make it possible to intervene more flexibly in cases of an incident. The fire stations will be situated between runways 25R and 25L on the edge of the airport terrain, rather than at the top and bottom of these runways. The new buildings have been designed to be energy-neutral and so are able to generate energy independently. For example, solar panels will be placed on the roofs of the buildings, with solar boilers and water pumps. The rainwater will be buffered to be infiltrated again or to be reused, for example for sanitary purposes and as extinguishing water. The Brussels Airport fire service consists of 120 firemen and women (including a medical team) who work in teams in order to guarantee 24/7 permanence at the airport. In the autumn, the service will be strengthened by another 15 persons. The fleet of fire engines at Brussels Airport consists of over 20 vehicles, including big crash tenders and smaller fire trucks for both aircraft incidents and building fires, as well as vehicles and cars for medical purposes or accidents. Apart from the garages for these vehicles, the fire stations will also house offices for the fire prevention service and for the coordination of emergency medical aid. They will also feature training and living areas including a kitchen, dining area and sports hall with fitness equipment. Fire service teams at airports are obliged to comply with various legal guidelines. For example, they must regularly train for interventions and emergency situations. At Brussels Airport, intervention drills take place on a daily basis in one of the various training airplanes. This involves, e.g. the extinguishing of fires and the rescuing of passengers. Every two years a large-scale emergency drill is held with various departments of the airport and with the provincial authorities. Another legal requirement is that fire service teams are able to reach an aircraft within three minutes of the incident alarm and to reach the terminal within five minutes. This response time will still be guaranteed in the new fire stations. This entry was posted in Airports, Business, Travel, Travel Management, Travel Safety, Travel Services, Travelers and tagged airport tarmac, Brussels Airport, invests, two new fire stations. Bookmark the permalink.